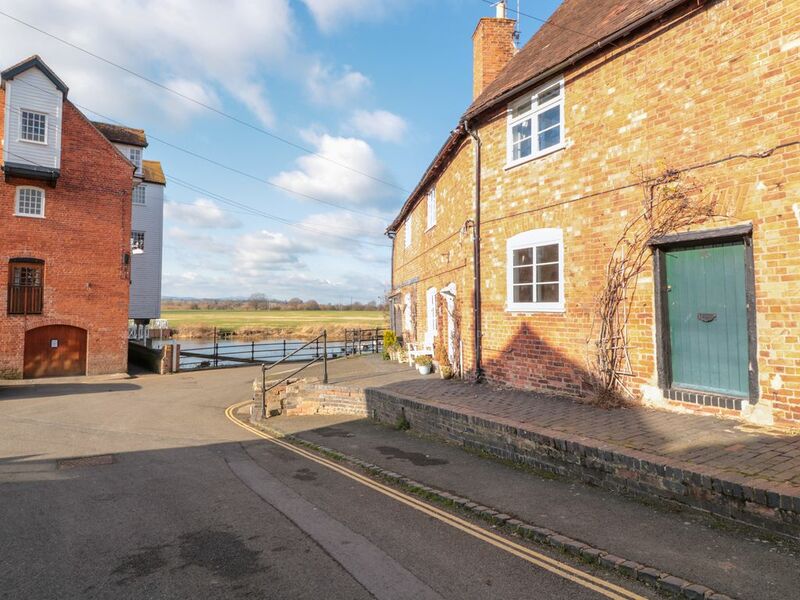 A mid-terrace property situated within the village of Tewkesbury. It houses two bedrooms and can sleep up to four people. River Cottage is a mid-terrace cottage resting within the town of Tewkesbury. It houses a first floor super king-size double bedroom and a second floor king-size double and a bathroom, complete with a bath, separate walk-in shower, basin and WC on the first floor. Additional rooms include an open-plan living room, offering a kitchen area, a dining area and a sitting area. Outside, you will find a rear courtyard with garden furniture. River Cottage is an idyllic base for a family holiday to the Cotswolds. Amenities: Gas central heating. Electric oven and gas hob, fridge/freezer, washing machine, TV, selection of books and puzzles. Bed linen and towels inc. in rent. Fuel and power inc. in rent. Travel cot available. Enclosed courtyard with patio garden. Roadside parking nearby and parking in chargeable car parks nearby. One well-behaved pet welcome. Sorry, no smoking allowed. Shop within a 2-minute walk. Shop within a 10-minute walk. Leisure center with swimming pool, sauna, gym 10-minute walk. Town: Tewkesbury is a riverside town located within the Cotswolds, on the confluence of the River Severn and Avon. Within the village you will find a selection of eateries, shops and pubs, as well as a country and farmers' market, musical events and Vintage and Food Fairs. For attractions, you will find 12th century abbey, several museums and a Heritage Centre. Close by is the spa town of Cheltenham and the city of Gloucester. Over three floors. Two bedrooms: 1 x super-king-size bed (zip/link can be twin on request), 1 x second floor king-size double. Bathroom with separate shower, basin and WC. Open-plan living room with kitchen area, dining area and kitchen area. Gas central heating. Electric oven and gas hob, fridge/freezer, washing machine, TV, selection of books and puzzles. Bed linen and towels inc. in rent. Fuel and power inc. in rent. Travel cot available. Enclosed courtyard with patio garden. Roadside parking nearby and parking in chargeable car parks nearby. One well-behaved pet welcome. Sorry, no smoking allowed. Shop within a 2-minute walk. Shop within a 10-minute walk. Leisure center with swimming pool, sauna, gym 10-minute walk.